At one point during the application process to join Sheffield Engineering Leadership Academy, I was asked to speak about a project that I was passionate about. While there were quite a few enriching experiences in my first year at Sheffield, I chose to talk about Project SunbYte. Project SunbYte is a student-led project in collaboration with other universities and industry partners: Northumbria University, Queen's University of Belfast, University of Hull, Andor and Alternative Photonics. Our goal is to deliver a low-cost, high resolution method of imaging the sun in the upper atmosphere where atmospheric distortion is minimised. This will hopefully allow us to see the sun's spirals and prominences, thus giving us more insight into the solar flares that threaten our satellite telecommunication and navigation systems. To do this, we are designing and building a two-axis gimbal to be integrated with a solar telescope and actuation system with sun-tracking software. The experiment will be on board the BEXUS balloon as part of the REXUS/BEXUS programme. 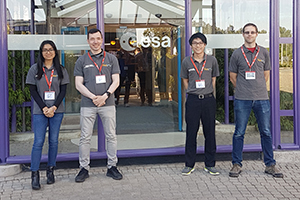 I was given the opportunity to attend our Critical Design Review (CDR) in the European Space Agency (Netherlands) with three other team members, one of them being fellow SELA student and SunbYte team leader, Yun-Hang Cho (SELA Cohort 2014). Our final design was presented and assessed in front of experts from the European Space Agency (ESA), the Swedish Space Corporation (SSC), and the German Space Agency (DLR). 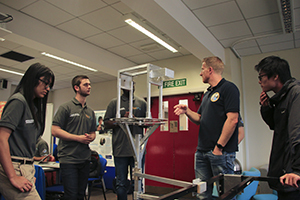 Representing the mechanical subsystem was a daunting task, but it was a chance to practise delivering technical information and gain feedback both in technical details and in project management, presentation and teamwork. On the 30 May we arrived at the Erasmus MML at the European Space Research and Technology Centre (ESTEC) to give our presentation for the CDR. We began with the presentation which lasted 20 minutes, followed by a 40-minute question and answer session assessing our progress. Another way that SunbYte has prepared me for SELA, is in terms of my management skills. As with most engineering projects, there is a great deal of work to be put in leading up to the final design. A good management plan and effective team dynamic is absolutely integral to success. For instance, when planning schedules and assigning task leads, conducting psychometric tests such as the Belbin test to help gauge the way different people behave in a team, and acting accordingly with the results. The purpose of milestones such as the CDR is to make sure we maintain this, and if not, the REXUS/BEXUS programme is after all, a learning process. It was the similar potential to learn such skills that attracted me to SELA. While SunbYte has set me up well for SELA, I feel it is more so in a way that it has allowed me to reflect on many areas of development. The seven foundational attributes of SELA act as an excellent guide to plan for these. I very much look forward to my time in the programme and the many resources such as workshops, talks and projects available. As our team leader, Yun, once said, "SELA was like a motorway for students looking to become leaders not tomorrow but today. Were SELA not present, these students would reach their goals but they would need to take the A roads. The opportunities gifted to me by SELA have allowed me to not only practise leadership, but to also provide a platform for non-SELA students to become better Engineers and achieve something greater. For that, I am grateful for all the support SELA has given me in order to allow me to create the change that I desire in the world." Throughout my time in SunbYte, I have been able to develop those attributes that are valued by SELA. I was first involved with the project through planning and coordinating the project's outreach activities. These were important in terms of gaining funding to support our experiment, as well as fulfilling a tertiary objective of the project -- encouraging more people into space engineering studies. It was easy to see the value in presenting a compelling image of our vision as a team. The day before our review, we met with Delft Aerospace Rocket Engineering (DARE), where I was able to witness this ability to inspire first-hand. DARE is one of Europe's most successful student rocket societies based at the Delft University of Technology. They showed us around the Dreamhall, their manufacturing-oriented workshop, which included letting us see a life-size model of Stratos II+ (famous for setting the European altitude record for a student-built rocket at 21.5km). Coincidentally, Stratos I was launched from Kiruna in Sweden, where our experiment is to be launched in October, assuming all goes well.